Ignorance is the greatest threat to a child with food allergies. Well-intentioned family members, teachers, and friends would never knowingly put a child at risk, but may unwittingly expose the child to an allergen. That is why it is so important to stress the severity of the food allergy and explain what it means. For example, if a child is allergic to tree nuts, explain which nuts are considered “tree nuts” (pecans, almonds, walnuts, etc.). It also helps to go into detail about how severe the allergy is. Some allergies are less severe than others, but anaphylactic allergies can be life-threatening. Explain that cross-contamination could be a danger, and that all ingredient lists should be thoroughly examined. Even after explaining an allergy, it is always better to be safe than sorry. When attending holiday dinner functions, bring along a few dishes you know are safe for your child with food allergies. If your child’s classroom is having a holiday party, send along a special treat that your little one can enjoy instead. That way, they don’t feel left out, but are safe from allergens and cross-contamination. Always keep your child’s allergy medicine and/or epinephrine injector available, in case of emergencies, and be aware of hospitals that are nearby. It may be beneficial to teach family members and friends what to do in case of an emergency, for future reference. Depending on the age of your child, they may or may not recognize the severity of their own allergy. Older children may be able to steer clear of unsafe foods, but younger children may not understand their food allergy. Children are tricky; they may seem perfectly safe sitting in the front room playing with other children, but all it takes is a few seconds and a bowl of mixed nuts on the coffee table for an emergency to occur. Because of this, it is important to keep an eye on your child. Plan with your partner, or another adult, to take turns supervising the child. You don’t have to hover, but keep a watchful eye on their activities. That way, you still get time to socialize, while still making sure your child is safe. 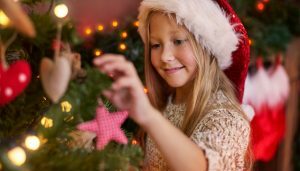 Even though the holidays can be stressful for parents with allergy-prone children, it is important to stay calm, cool, and collected. If you are anxious and worried about your child’s food allergies, it will rub off on them. It is vital that your child not fear their allergies, but rather be knowledgeable and confident about them. Talk with your child ahead of time about what to expect. Walk them through what they can and can’t eat. Always have an action plan prepared. Try not to scare the child, but rather prepare them so they can enjoy the holidays and stay safe at the same time. The Association of Childcare Physicians understands you may have concerns about your child’s allergies and we are happy to answer any questions you may have about their health. It is our goal to keep your child happy and healthy! To schedule an appointment or physical, please call Dr. Shaw or Dr. Kellow at 618-235-2311 or visit childcarephysicians.com.